Have you ever made your own custom apparel for sport teams, clubs, organizations,etc? There have been many times I have wanted to but never sure how to do it or where to do it. I participated in an Influencer Activation on behalf of Influence Central for MyLocker. I received product samples to facilitate my review as well as a promotional item to thank me for my participation. With this review, I got to try out the MyLocker website to create and design my very own "mom of a TKD student". I loved doing it so much that I can't wait to design something else. Custom T-Shirts are so much fun to wear. Just last week I was at a youth conference where the volunteers had a specific shirt as well as the attendees. These days you do not have to limit your creative side to just make your own t-shirts. MyLocker allows you to design your own custom t-shirt, custom hoodies, golf polos, fleece, bags and other gear. Could you use some custom gear? If so, for what? Overall I was loving the MyLocker website because of the huge selection of products, designs and color choices. I think it is great that they do not have a minimum order so you can get one or 100 of something and not charged more. I haven't received my two custom pieces but when I do I'll add the quality of the product to my post. This was my first time making a custom t-shirt so I do not have anything to compare it to. The website was a tad slow and for some reason the design I chose on a particular shirt wasn't an ordering option. I didn't know this until a few days after I ordered which slowed down my shipping. Besides that, I loved all of the design choices and wide variety of products. Customer services responded to my problem order with this, "It's been a few days since you placed your order and we want to let you know that we're busy jumping through ginormous flaming circus hoops to complete it. (Some of us do this more gracefully than others!)" which I thought was sweet and sincere. I would love to create some custom shirts for birthday parties and family holiday gifts. I love seeing photos of large families wearing the same shirt and can see me doing this for our family. 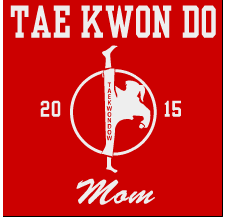 One of the shirts that I did create was for TKD Mom. I love "mom" or "dad" shirts which support clubs and sport groups. My daughter has been in TKD for ages and this is my first "mom of shirt"!!! I can't wait to sport it at the next TKD event. I also think that these type of custom products would be great for group fundraisers. The cost seemed reasonable and they can be resold so groups can make a profit. I know that our youth group could do something like this for their next conference. Can you see yourself creating custom products? Hop over to MyLocker and see for yourself all that they offer. You can also follow them on Twitter.